In order for you to truly get the most out of your garage door system, you need to ensure that it is properly maintained over time. That entails a lot of effort, so why not simply have our experts take care of this aspect for you? We know exactly what to look for while inspecting the system, and what needs to be adjusted and lubricated in order to ensure optimal efficiency. 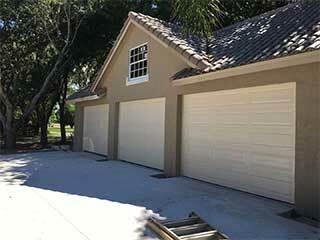 Your garage door system consists of a lot of moving metal parts, all of which will suffer due to friction over time. By having our technicians inspect all of these components and apply them with the right type of lubricant, your door will be less likely to fail, and these parts will end up lasting a lot longer, which will save you money on future repairs. As the main load bearing parts of your door, the springs need some additional attention and care. They can wear out over time, which will cause the door to get off balance gradually. We'll test the opening of the door to determine whether spring adjustment is in order or not, and we'll replace these units completely if we find evidence of deformed coils. A broken spring can be incredibly dangerous, so it's always recommended to have these components replaced before they end up snapping. An automated system can add a great deal of convenience to your daily life, but seeing as these aren't people but machines, the automated process can be dangerous when its safeguards aren't working correctly. That's why we'll make sure the safety sensors haven't become misaligned, and that the door is able to properly reverse when it encounters resistance. Whether you'd like to schedule a maintenance appointment, or you need emergency repairs, our team is at your service. Give Garage Door Repair Champlin a call today and let us make sure your system is operating at peak efficiency.